Lately I've been crushing hard on yellow, which is odd because it's always been one of the colors that I have steer clear of. Not really intentionally, it just somehow never called my name - however now I'm hearing it loud and clear now! This cheery color looks amazing on clothes and accessories. From tops to bottoms to outerwear, it transitions perfectly from summer to winter. It's a great way to add a little punch of color to your wardrobe, don't you think? i have mustard crush!lol! i could quite happily add a dash of it to most outfits or wear it as a main colour. love all the inspiration above!! I just got a mustard yellow and grey sweater which I am loving...great trend! 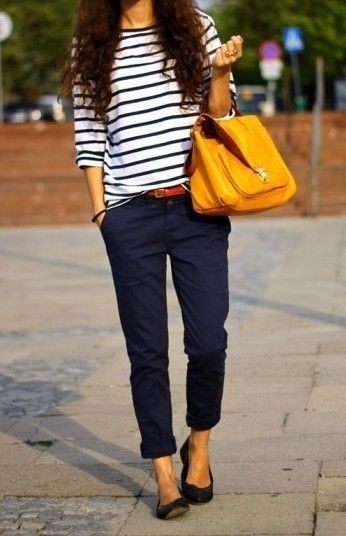 Love navy and yellow together. Although unfortunately with my skin tone and hair - I don't look good in yellow! Bummer. Perhaps we could follow each other? Totally want to recreate that last look! Yellow is a great color. I need to incorporate it more.